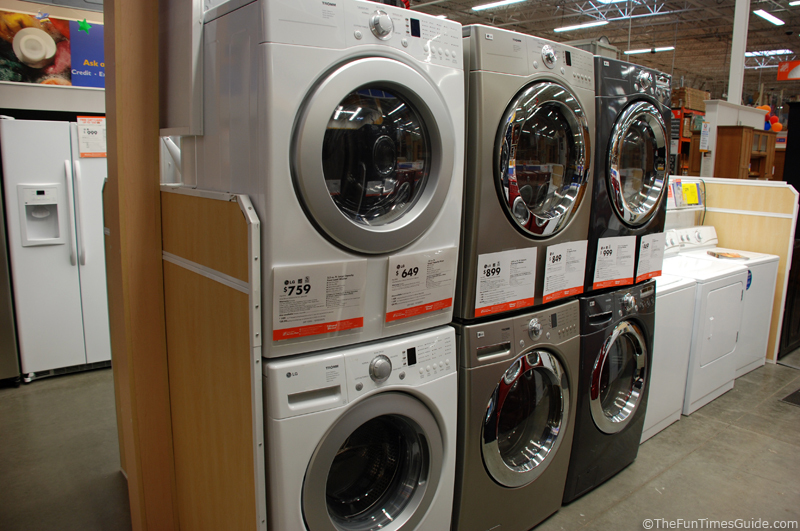 Washers And Dryers And Refrigerators… Oh My! I went appliance shopping the other day. …And I took 15 pages of notes! Yep, I spent close to 3 hours at the local Home Depot and Lowe’s stores trying to get some basic ideas for our kitchen and laundry appliances. I don’t know where we’ll eventually buy our appliances from, but I simply wanted to get some general information about the products available on the market today. As I inspected, opened, closed, turned, sized, and photographed practically every appliance that the Home Depot had on display (their selection was about 1/3 that of the Lowe’s store), I jotted down notes about each one in my 5×7 notebook. I’ll be sharing my notes about the specific appliances in future articles, but I just thought I’d give the general overview at this point. #1 Overall Dimensions — I was hoping to get a better idea about how much space to allow for the appliances in our laundry room and kitchen cabinetry design. #2 Overall Quality — How flimsy were the drawers? How easy did the doors open & close? How effective was the door seal at keeping out air? How solid does the product seem overall?… which would determine how long the product was likely to last in our home. How do the manufacturers compare? We currently have all GE Profile products in our kitchen (…now almost 6 years old, and practically trouble-free). And a Sear’s Kenmore washer & dryer (…nearly 16 years old, and absolutely trouble-free). My first thoughts were… We didn’t pick the GE Profile products in our current home, our builder did. Probably because they were the most economical. But, as it turns out, they may also be the best quality, too. When I set out to explore appliances, I was so sure I would be coming home to break the news to Jim that we would be spending a lot more on “expensive” appliances for a change — because I thought I would love the Bosch and/or the LG products that I’ve heard so much about. Nope. Quite the contrary. This visit merely confirmed for me that the old tried & true appliances with the familiar names of Maytag and GE may, in fact, be the best choices for us. For what it’s worth… the sales rep at Home Depot said that Whirlpool recently purchased Maytag. I was excited to learn more about Bosch and LG because I’ve seen so many of their commercials on TV lately. And their products have also been in all of the leading magazines, too — not only in the paid advertisements, but in the articles as “recommended products”, as well. I think one of the reasons their products are all the rage is because they’re coming out with “the first this” on a washing machine, or “the most that” on a refrigerator. You get the idea. But believe it or not, I was not impressed by either Bosch or LG. Each had one or two things that I liked. But overall… no way! the detergent & fabric softener compartment seemed the most sturdy and solid among all of the brands. …So, there weren’t a ton of differences, but the little things really made an impression on me. More often than not, it was the lack of any “wow factor”, that was accompanied by a much higher price tag. Overall, GE (mostly their Profile line) and Maytag (also sold as Whirlpool) have kitchen appliances, washers and dryers that seem far superior to me than all of the other brands I looked at. Check out these tips for dishwasher shopping – and see the top ranking dishwashers.